In hindsight, discerning what works and what doesn’t in a credit card is relatively easy, but it’s unrealistic to choose a credit card, decide it doesn’t work and then apply and receive another one. The benefit of trial and error just isn’t an option. But, what we can do is take a look back and see which no annual fee credit cards rose to the top over the past year so that consumers can at least have the benefit of tried and true offers based on consumer satisfaction. So, with that in mind, we take a stroll back through 2012 to find those great credit card offers that have no annual fees. A classic favorite, this Chase credit card has a lot of perks to go along with its no annual fee feature. It’s made for people with a strong credit history with no past bankruptcies or collections. Take a look at a few of the many features. First up, you’ll enjoy a $100 cash back bonus after your first $500 in purchases. You must hit the $500 threshold during the first ninety days. Not only that, but there’s a 0% intro APR for 15 months on both your purchases and balance transfers and you’ll earn 5% cash back on up to $1,500 spent at hotels, airlines and retailers such as Kohl’s and Best Buy. Your 5% cash back categories rotate every three months so you can maximize your savings on things like gas stations and restaurants. Remember you’ll need to activate the feature; it’s free, but it’s one you have to opt into. All other purchases earn unlimited 1% cash back but there’s also a great opportunity for up to 10% cash back. You can find these savings through the online merchants that partner with Chase. And, of course, there are no annual fees associated with this Chase credit card offer. This relatively new Visa card is like none other offer on the market today. You earn 1 point for every dollar spent, 2 points for every dollar spent at Kroger grocery stores and 3 points for every dollar spent on Kroger brand groceries. Of course, you’re not limited to Kroger supermarkets, this is just an added bonus for those who shop the grocery store chain. There’s a 0% introductory APR on both your purchases and your balance transfers for 9 months. After that, your APR should land between 13.99% – 23.99%, based on your creditworthiness. Here’s what makes 1 2 3 Rewards Visa different – it serves several purposes: it’s a grocery rewards program, a cash back program and a rewards credit card. Online account management, around the clock customer service and, of course, no annual fee. You’re covered by zero fraud liability, too. Discover is known for its great features and remarkable customer service and the Discover More is one its most popular offers. There’s a 0% intro APR on purchases and balance transfers for 15 months. You’ll earn 5% cash back on your first $1,500 spent at various retailers – including brick and mortar retailers or online retailers and these bonus categories rotate four times a year, too. Be sure to activate it when you receive your card. You’ll enjoy savings on gas, travel and restaurants. Not only that, but there’s the opportunity to save up to 20% in cash back bonuses when you opt to shop through the Discover site. You’ll discover the enhanced customer service, too. You’ll enjoy around the clock access to a U.S. based account manager within one minute. With $0 fraud liability, you’ll never be held responsible for any unauthorized charges and you can also sign up for text and email alerts so you’re always in the know. Finally, there are no rewards redemption fees, no fees for additional cards and no annual fee. Another Chase favorite, many discovered this offer in 2012 and have yet to look back. There’s plenty of reasons for that loyalty, too. They’re earning 10,000 bonus points after spending $500 in the first 3 months as well as two points for every dollar spent at their favorite restaurants and one point for every dollar spent on anything else they use their Chase Sapphire for. We’re always impressed when a credit card network guarantees instant access to its customer service reps and Chase certainly delivers. You don’t have to worry about your points expiring nor do you have to keep track on how many points you’ve accumulated – there are no limits on how many you can earn. There’s a lot the points can be used for, too – including cash. No annual fee sweetens the deal and the feedback from consumers who carry this card tells the tale. This is a fine miles rewards card with lots of added features, including .25 miles for every dollar spent on every single purchase you make with your One Card. Spend $1000 during your first three months of membership and earn an impressive 10,000 bonus miles, which can be redeemed in a number of ways, including airline tickets, car rentals and even hotels. No limit on how many rewards points you can earn, either. What really makes this a great card for travelers is you’re not limited to one airline – you can use your rewards points on any airline you choose. Plus, because your points never expire, you can take the time necessary to earn enough miles to fly free. No blackout dates keeps it wide open for your travel plans. And speaking of travel plans, there are no foreign transaction fees, either. There’s an intro 0% APR through August 2013 and no annual fees with this card offer. Have you found the perfect no annual fee credit card that meets your needs? Share your story with our readers. 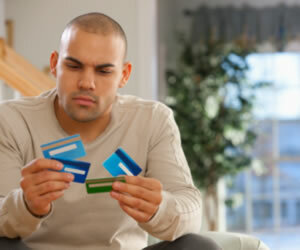 Also, if you’ve had bad luck in the past with no annual fee credit card, we want to hear that story too.